A severed head discovered in a quarry skip had teeth which could help detectives identify the remains, it has been revealed yesterday this morning, Friday May 20. The head was found at a quarry in Mepal, Cambridgeshire on Monday, May 16, but no other body parts have yet been found. 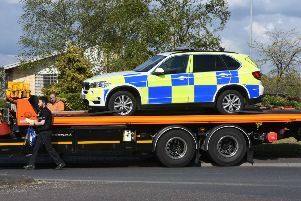 It is believed the skip originated from 40 miles away in Bedfordshire and crime scene investigators have remained at the Mepal quarry and construction site in Sharnbrook, Beds, since the discovery.